This screensaver features a flotilla of 14 different hot air balloons floating in more or less random flightpaths against a backdrop of the Colorado Rocky Mountain Front Range. 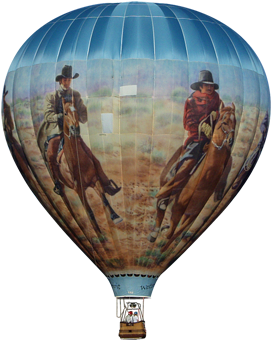 All balloons are created from original photographs by Bruce Quackenbush, taken at the Rocky Mountain Balloon Festival from 2006 to 2008. 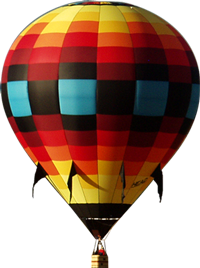 This spectacular annual event is held at Chatfield State Park in Littleton, Colorado. 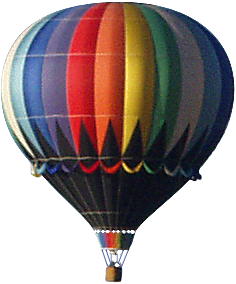 The flight paths of most of the balloons are randomized to ensure all pixels on your monitor are cycled often enough to prevent "burn-in" on CRT or flat-panel monitors. The animated demo at the right is a compressed GIF meant to give you a rough idea of the screensaver. The movement of the balloons in the actual screensaver is smooth and realistic. Full support for multi-monitor systems! Balloons float smoothly across all monitors. The free version of this screensaver contains one "Purchase this screensaver..." reminder that floats across the screen occasionally. There's no "tryout" period, no disabled features, and no crippling nag screens. My hope is that you'll enjoy the software enough that it will be worth $15.00 to you. The registered version is free of distracting purchase reminders. 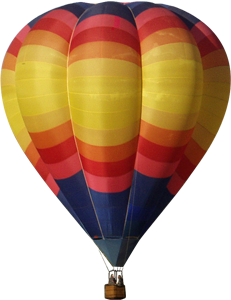 When you click the download link below you will be prompted to Open or Save the file colorado_balloons_unreg_install.zip. This is a compressed (zipped) folder 3.10MB in size. You can Open it directly, or choose Save and select a temporary folder on your computer. The ZIP file contains the executable installer program, double-click to run. Then just follow the prompts.